Manor Garden ShedsSteep pitched roof, single story, up to 288 sq. ft.
Classic Garden ShedsTraditional roof line, single story, up to 468 sq. ft.
Patriot Garden ShedsTraditional, New England details, single story, up to 468 sq. ft. 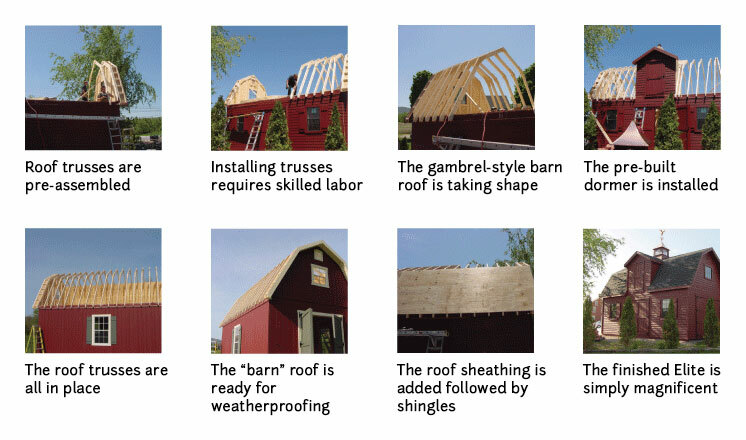 Although our Classic and Patriot sheds are delivered complete and require no on-site assembly, our larger and more highly-customized garden sheds will require some amount of on-site finishing. 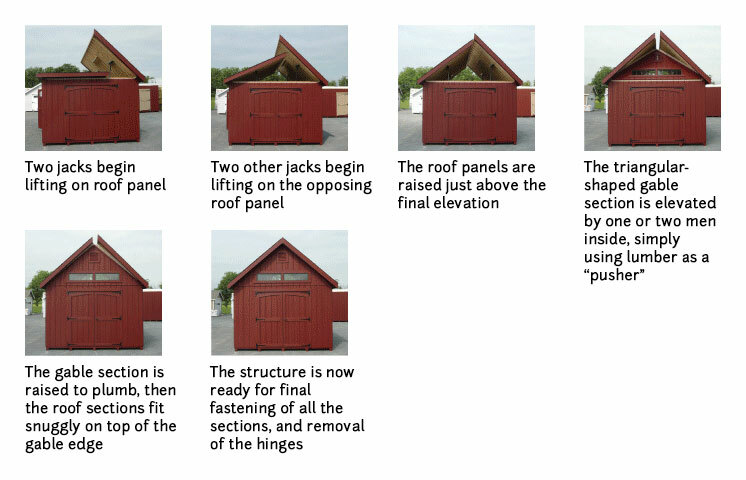 Read on to learn about installation requirements for our Manor and Elite sheds. The Manor model features an exceptionally high-pitched roof, plus 7’ 4” high walls, for added headroom and an overhead storage loft, for storing lengths of wood, for example. But how do you ship something that has to pass beneath bridges? Our innovative solution features fold-down roof panels, already assembled, mounted on heavy duty hinges to hold them securely in place during transport and assembly. All panels are pre-assembled, square and plumb, and the entire roof section can be raised in a matter of just a few minutes. We do this thanks to our exclusive roof jacks, designed and engineered especially for Classic Garden Structures. Four jacks are needed for assembly of the average Manor model. The impressive two-story Elite models from Classic Garden Structures are shipped as complete as possible, allowing for height restriction for transportation. Packaged inside each partially pre-built structure are all the parts and supplies required to finish the upper story and roof. We typically send our own crews to handle the final on-site assembly of Elite models, but some of our dealers handle assembly with their own crews. Either way, unless you are an experienced builder yourself, this is not a do-it-yourself level project. Our high-quality garden sheds are a stylish and useful addition to any property. Call us at 717-768-0457 or click below to hear from the dealer nearest you.